NEW DELHI: The Election Commission of India may schedule assembly polls in Jammu & Kashmir, currently under President’s rule, after voting for the Lok Sabha is completed, taking into security considerations, inputs from the state and precedents. 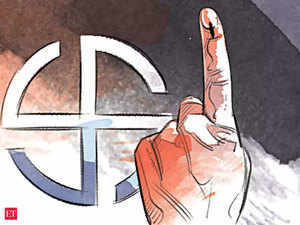 Most political parties have backed holding assembly elections in the state simultaneously with the Lok Sabha polls. 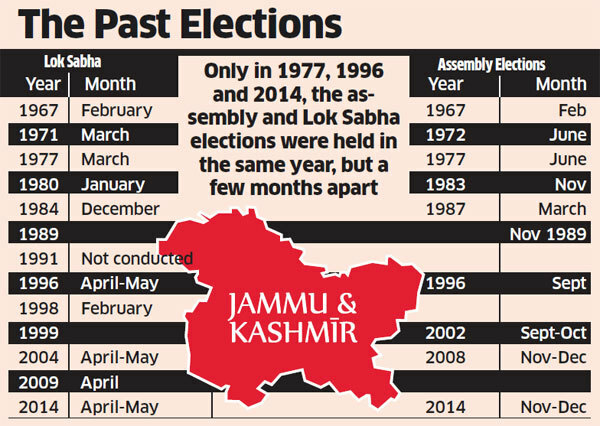 However, since 1967, J&K has never gone to the polls along with the general elections and only in 1977, 1996 and 2014, have they been held in the same year, although a few months apart. The state administration has flagged this aspect to the commission, ET has learnt. Elections in J&K are usually held in many phases because of the considerable security that has to be deployed. The Lok Sabha elections require heavy security deployment across the nation, making it difficult to spare forces for J&K. Recent trends indicate that the state may require undivided attention on all fronts, as evident after the 2017 Srinagar bye-poll, which left a trail of eight deaths and a record low voter turnout of 7%, equalling the dismal voting trends during the peak militancy period. The EC has not even been able to hold the bypoll to Anantnag parliamentary seat, which has been pending since June 2016 when Mehbooba Mufti vacated the seat to become the chief minister. It has now become the longest delayed bypoll in the country since 1996. Barely a week before J&K came under Governor’s rule in June, the state DGP had sent a report to the EC stating unambiguously that the Anantnag bypoll cannot be held due to the deteriorating law and order situation. J&K chief electoral officer Shailendra Kumar said the EC will take the final call on the state’s assembly election after consulting political parties and the state administration. The last time the state assembly and Lok Sabha elections were held simultaneously was in February 1967. Since then, both elections have been held a few times in the same year, although some months apart.